HO HUP Construction Co Bhd may jointly develop its 4.3ha land in Bukit Jalil after shareholders blocked a plan to sell the piece of property. Ho Hup wanted to sell the land to Permata Juang (M) Sdn Bhd, a unit of Magna Prima Bhd, in a related party transaction for RM19.4 million. Its deputy executive chairman Datuk Lye Ek Seang is also a director of Magna, while its current managing director Lim Ching Choy was a former executive director in Magna up to May 14. The freehold land in Bandar Bukit Jalil cost Ho Hup RM11.82 million, and a sale would have brought in a gain of RM7.58 million. Ho Hup, bleeding red ink since 2006, had proposed the sale to help pare down RM104.52 million debts. "We withdrew (the resolution) because we did not have enough shareholders' support. We need time to pass (the resolution). 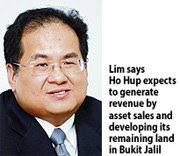 We will look for options ... sell the land or find a joint-venture partner to develop the land," Lim said after Ho Hup's extraordinary general meeting in Petaling Jaya yesterday. Shareholders, however, approved another resolution to sell 2.2ha of land in Bukit Jalil to Santari Sdn Bhd for RM9.8 million. Lim also said that in the next six months, the company expects to generate revenue by asset sales as well as developing the remaining 24ha of land it still has in Bukit Jalil. "This 24ha land is earmarked for a mixed development, comprising shop apartments, lifestyle piazza and office blocks. We expect to launch the development by next year," he said. Lim declined to disclose the gross development value of the project, but it was learnt that it is valued at RM1.6 billion. Elsewhere, Ho Hup is also looking to build some 20 units of semi-detached houses in Bukit Jalil, valued at RM30 million. The project is expected to be launched in September this year. "We are also active in Madagascar, whereby we have got back our machinery, valued at RM21 million. We are now pursuing machinery rental to get income from there. "We have started negotiations with interested parties. Once contracts are finalise, we will make an announcement," he said. Moving forward, he said Ho Hup will focus on its core businesses of construction, property and trading, including the rental business in Madagascar. He said the company expects its property business to contribute between 70 per cent and 80 per cent to the group's revenue. PETALING JAYA: Ho Hup Construction Co Bhd yesterday withdrew one of two land disposal proposals tabled for approval at the company EGM, worried that the involvement of an interested party in that exercise could raise shareholders’ objection. “We are still looking for options to sell the land, maybe via a joint venture with other partners but I think it will not be difficult. However, we need time to solve this matter,” group managing director Lim Ching Choy said yesterday after the meeting. Lim said shareholders did not support the second land disposal plan due to conflict of interest issues. The company had proposed to sell two plots of land in Kuala Lumpur to Santari Sdn Bhd and Permata Juang (M) Sdn Bhd (PJSB) for a total cash payment of about RM29.24 mil. PJSB is a subsidiary of Magna Prima Bhd whose director Datuk Lye Ek Seang also sits on the board of Ho Hup. Lim was also an executive director at Magna Prima before joining Ho Hup as group managing director. On Ho Hup’s operations in Madagascar, Lim said the company had obtained back all the machinery confiscated by the Madagascar government following a settlement and now planned to lease them in that country for some income. “By leasing, at least we can see some positive income to the company even though not that substantial,” he said. Ho Hup had been involved in a legal tussle with the Madagascar government over a terminated 400km road project. Lim said for the next six months, the company would continue to generate value from its property projects in Bukit Jalil and launch a mixed development project next year, also in Bukit Jalil. TEMERLOH: All houses and business premises owners here are reminded to settle their outstanding assessment fees to avoid court action and the sealing of properties. Temerloh Municipal Council president Datuk Zulkifli Yaakob said up to early this year, debts owed to the council stood at RM7mil. He said during the Ops Sita conducted last month, its enforcement division managed to collect RM2mil in outstanding debts. “We hope to recover another RM2mil in outstanding taxes before the end of this year,” he said here recently. Zulkifli said taxpayers’ money would be used by the council to carry out various projects to upgrade infrastructures and public facilities in the district. He said records showed that Mentakab had the highest number of outstanding debts due to the many business premises and housing estates. “In the latest operation, we succeeded in collecting outstanding debts amounting to RM300,000 from 97 business premises and houses in Taman Temerloh Jaya. “The move was provided for under Section 148 of the Local Government Act 1976,” he said, adding that the council would continue to initiate such operations from time to time, targeting those who were still adamant and reluctant to pay up. Zulkifli said defaulters were being unfair to others who paid on time but utilised the same facilities managed by the council. UEM Group Bhd has been offered huge projects in Vietnam and is also mulling whether to accept a contract to build a bridge in Phnom Penh, Cambodia. The projects in Vietnam are worth a "few billion US dollars", chairman Tan Sri Dr Ahmad Tajuddin Ali said in an interview in Kuala Lumpur recently. They are in Da Nang and Ho Chi Minh City, and work includes building an airport and a port. "It's so big that we may have to rope in other Malaysian contractors," Tajuddin said. The bridge project in Cambodia is worth about US$100 million (RM356 million) and UEM is in the final stages of evaluating the job. Vietnam has been a favourite destination for Malaysian builders, with companies like SP Setia Bhd and Gamuda Bhd already having a presence as they seek to grow profits amid a slowing home market. UEM Group has ventured abroad through its construction arm UEM Builders Bhd, mainly to countries like India and Qatar. Tajuddin also said that UEM was confident of defending itself against a legal suit from the Qatar Public Works Organisation. "We have received from the Qatari authorities the certificate of completion for the entire Salwa Road project. We have also got the extension of time for the job to January 31 2009," he said. Because of this, UEM Group will not make provisions for the suit. At the same time, it also has a RM1 billion claim for work already done for the same project. It is understood that the Qatar Public Works Organisation is seeking damages, reportedly about 878.3 million Qatari riyal (RM880 million), against design consulting engineer Parsons International Ltd, UEM and Qatar Insurance Co over work on the Salwa International Road. UEM has been named as the second defendant in the suit, Tajuddin said.